Extra-thick Premium Print Yoga Mats provide a stable, sticky, non-slip 5/6mm cushioned surface for your yoga practice. 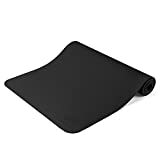 Perfect for home or studio use, this mat ensures the safety and comfort you need to enhance proper alignment and maintain poses and the additional cushioning helps to protect joints. Manufactured free of the top six most harmful phthalates, this mat is a healthier choice for both you and the planet! Please note a packaging change from 5mm or 6mm, but rest assured it is the same size and style mat, just in new and improved packaging. Also, printed yoga mats may release a harmless odor when first unwrapped. For best results unroll and air out your mat for 2-3 days before use.